Another toss won by MS Dhoni. Another batting crumble for Zimbabwe. Another facile target for India. Another comprehensive Indian victory. The story has been same. As has been the characters. India defeated Zimbabwe by 9 wickets in the first ODI and by 8 wickets in the second ODI today. After Dhoni put the host team to bat, their fall down began in the fifth over itself. Hamilton Masakadza went against a Barinder Sran half-volley, only managing to hit it straight in the hands of Jasprit Bumrah, who was fielding at third man. Sran picked up his second wicket in his next over when an unlucky Peter Moor was adjourned leg before the wicket. In the replay, hawkeye suggested that the ball would have missed the stumps. Chamu Chibhabha was the next man to go when Dhawal Kulkarni trapped him in front of the stumps in the 10th over. Zimbabwe was 39-3 after 10 overs. The top order had perished. The damage was done. Vusi Sibanda and Sikandar Raza did the repair work. The duo added 67 runs for the fourth wicket before Raza holed out to long-on. The next ball saw the demise of Elton Chigumbura who was found wanting in front of the stumps against Yuzvendra Chahal. The leg-spinner had picked two wickets in two balls. One thing which did not go in Zimbabwe's favor was the injury to Sean Williams just after the toss. Williams had replaced Craig Ervine earlier in the day. Sibanda's 53-run knock finally came to an end when he slog swept Chahal only to hand a catch to Kedhar Jadhav. Besides the sixth wicket, Zimbabwe had also lost the hope to score a respectable total. Richmond Mutumbami, Tendai Chatara and Taurai Muzarabani also fell in quick succession. The team was all out for 126 in 34.3 overs. Their last six wickets had fallen for a paltry 20 runs. 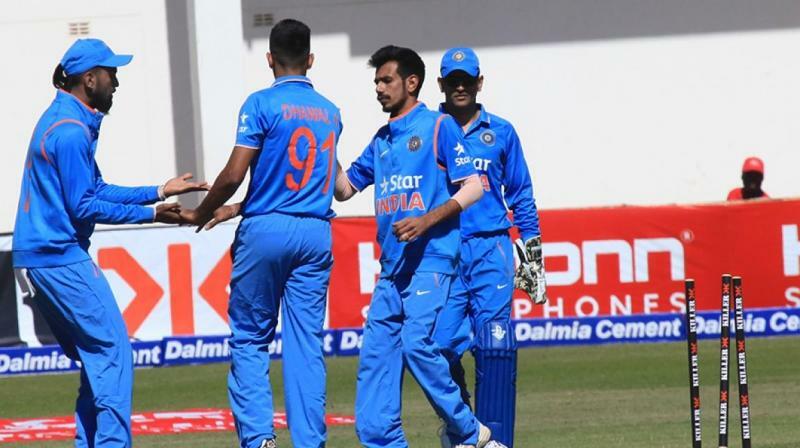 Yuzvendra Chahal picked up three wickets in quick succession. All Indian bowlers were among the wickets. Chahal was the pick of them with three under his belt. Sran nd Kulkarni picked up two each. Whereas, Bumrah and Axar Patel got apiece each. A target of 127 was like money for old rope for India. Karun Nair was out caught behind on a no-ball in the fifth over. Lokesh Rahul continued his form from the last match. India was 48-0 without the loss of any wicket at lunch. Nair and Rahul completed the team's half century in the first over after lunch. However, in the next over, Rahul (33) chopped on a Chibhabha delivery back onto his stumps. Ambati Rayudu came in at No. 3 and steadily steered the ship with Nair. Raza got his complementary wicket when Nair (39) played across the line to a straight ball. But the game was more than over until then. Manish Pandey came in to bat for the first time in the series and scored a boundary off the first ball he faced to seal a victory for India. Rayudu remained not out on 41. Chahal was awarded the Man of the Match. The questions to be answered for Zimbabwe have been constantly increasing. Their woes with the batting are just not coming to an end. Makhaya Ntini and Lance Klusener have a lot to ponder about. Their batsmen have to ensure some security in terms of runs for their bowlers to defend. Otherwise, the future lying ahead will only be a glimpse of the past.